Simon & Schuster Books for Young Readers, 9781416978862, 48pp. A breathtaking picture book illustrated by mega-bestseller Loren Long, about a young bat setting off into the world using only his good sense! and the song the world sings back to you. With these words, Chiro’s mother sends him off into the night for the first time alone. It’s an adventure, but how will he find his way? And how will he find his way home? As the young bat discovers, navigating the world around him is easy as long as he uses his good sense. This beautiful and touching coming-of-age story, with mesmerizing artwork from New York Times bestselling illustrator Loren Long and lyrical text from Ari Berk, conveys a heartwarming and universal message: No matter how far away you go, you can always find your way home. Ari Berk is the author of the Undertaken trilogy and Nightsong, illustrated by Loren Long. He works in a library filled to the ceiling with thousands of arcane books and more than a few wondrous artifacts. When not writing, he moonlights as professor of mythology and folklore at Central Michigan University. He lives in Michigan with his wife and son. Visit him at AriBerk.com. Loren Long illustrated President Barack Obama’s Of Thee I Sing; the newest version of The Little Engine that Could by Watty Piper; Madonna’s second picture book, Mr. Peabody’s Apples; Nightsong by Ari Berk; Frank McCourt’s Angela and the Baby Jesus; Love by Matt de la Peña; and If I Was the Sunshine by Julie Fogliano. He also wrote and illustrated the Otis series and was part of the Design Garage for Jon Scieszka’s Trucktown series. Loren’s work has appeared in Time, Sports Illustrated, Forbes, The Wall Street Journal, and The Atlantic. He lives with his wife and two sons in Cincinnati, Ohio. Visit him at LorenLong.com. "There is nothing at all cute about bats, but don’t tell that to the talented Long...who has managed in the past to make even a tractor endearing.... Berk’s able storytelling enriches and elaborates...."
"Ari Berk's (The Secret History of Mermaids) lyrical text and Loren Long's acrylic-and-graphite nightscapes re-imagine the classic tale of a young one leaving its nest as a journey of not only independence but also of creativity.... 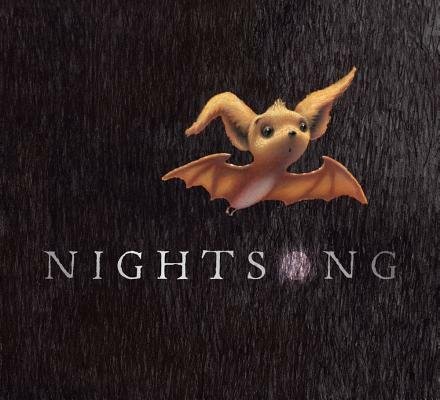 This lyrical, sumptuous picture book about a small bat taking his first solo night flight will inspire confidence in any child trying something new--and independently--for the first time." * "Not since Janell Cannon’s Stellaluna...have readers been introduced to such a charming young bat learning to navigate his world.... Acrylic and graphite illustrations reveal a dark night and a sweet, cuddly bat with a freckled nose and long pointed ears. Children in groups or one-on-one readings will enjoy hearing about this endearing character’s adventure."